Note: Automatic Knives may not be shipped outside of the United States. Additionally we cannot ship to the following states: Delaware, Hawaii, Minnesota, New Jersey, New Mexico, New York, Pennsylvania, Virginia, Washington or the District of Columbia. Blade Length Restrictions may apply to Connecticut and Vermont. 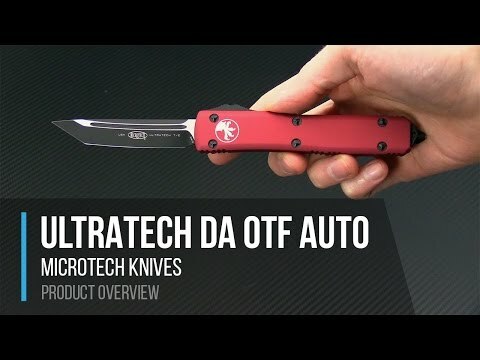 The Ultratech dual action out the front automatic knife from Microtech sets the standard for the category. This version has a Blue anodized and contoured handle and satin finished, CTS-204P, Double Edged blade. 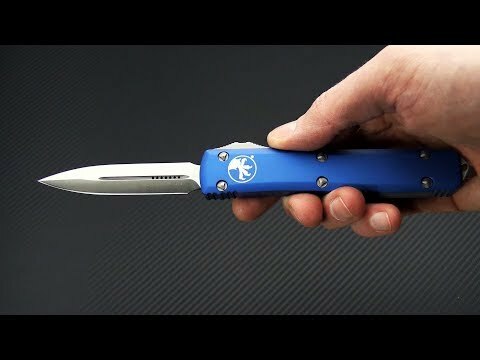 Brand new directly from Microtech Knives. Made in the USA. Blade: Equipped with a majestic satin finish, the dagger has double plain standard cutting edges on top and bottom. The fine point, dagger blade is made from premium, American, CTS-204P Stainless Steel.The 3.44 inch blade features a double action opening and retracting mechanism. Simply move the thumb slide on the side of the handle up to deploy and down to retract. An internal spring remains at rest in both the open and closed position to reduce wear. The action is smooth and fast. Handle: Smooth, Blue anodized 6061-T6 aluminum has contoured edges creating not only a comfortable feel in-hand but a smooth transition in and out of your pocket. There are several areas of machine-grooved texturing around the outsides aiding in grip. This lighter more ergonomic grip is easy on the hands and eyes. The handle's construction is completed with Microtech's proprietary hardware, glass breaker end and blasted pocket clip with individual serial number/date of production. Carries via a right hand, tip-up only pocket clip. CTS-204P: A highly wear resistant, powder metallurgy stainless tool steel, the steel contains a large volume of extremely hard vanadium carbides which provide excellent wear resistance. CTS-204P has some of the highest chromium content of a high-vanadium stainless steel currently available. The chromium-rich matrix provides outstanding corrosion resistance. Analogs to CTS-204P include CPM-20CV and Bohler M390.